Peter, the Chanter of Notre Dame cathedral in Paris, died in 1197 on his way from Paris to Rheims at the Cistercian Abbey of Longpont. He wrote a number of biblical commentaries, and this work, usually known as the 'Verbum abbreviatum' from its opening words, but also sometimes found under a Latin title meaning 'Treatise On The Castigation Of Vices And Commendation Of Virtues'. 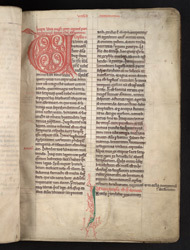 This manuscript has a medieval inscription stating that it belonged to the Cistercian abbey at Byland in Yorkshire, and the text opens with a decorated initial typical of the style found in manuscripts from Yorkshire Cistercian houses.